Nationwide, people visit their primary care providers for skin problems more than any other reason including joint problems and back pain, the 2nd and 3rd most common reasons. 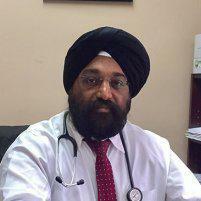 Dr. Inderjit Singh Kainth of Brunswick Internal Medicine Group PC sees many skin conditions at his practice. Don’t tolerate that rash or itchiness, hoping it will fade. Make an appointment at the offices in Kendall Park and Metuchen, New Jersey today. "Great doctor, excellent bedside manner, takes time to listen... Highly recommend." "Makes you feel very comfortable. I am going to keep him as my primary doctor." "Excellent physician - explains details and empathizes with patients' situations." “Great doctor , I will choose him as my primary doctor for me and my family." "Very knowledgeable, thorough, and explain things fully. Highly recommend." What’s dermatitis and what causes it? Dermatitis is a catch-all term that includes any number of skin inflammations. Typically, it creates swollen, red patches of skin that may be quite itchy. More severe cases of the condition may cause blistering, oozing, crusting over, flaking off, or peeling of the skin. While dermatitis isn’t contagious, the appearance of affected skin makes patients feel uncomfortable and self-conscious. What types of dermatitis exist? Atopic dermatitis, or eczema: Typically starting when the patient is an infant, eczema occurs where skin bends, such as on the elbows and knees. Leaking and crusting may occur after scratching, and the condition may come and go, varying in severity. Contact dermatitis: This a temporary condition, brought on by a substance that either causes an allergic reaction or naturally irritates the skin. Common substances causing contact dermatitis include poison ivy, soaps or components within soaps, and essential oils. Sensitivity varies by person. Seborrheic dermatitis: Typically affecting only oily patches of skin, this condition causes redness, scaly patches, and persistent dandruff. Known as cradle cap in babies and like eczema, seborrheic dermatitis varies in intensity and may completely disappear, only to flare up later. What are some other common skin conditions? Acne: This manifests as clogged pores, cysts, and pimples occurring on the upper half of the body. Serious cases, when left untreated, may cause scarring. Alopecia: This is the loss of body hair due to the immune system attacking hair follicles. Hives: These are pink, swollen spots that occur in groups anywhere on the body. Often, hives are due to an allergic reaction and fade after a few hours, leaving no trace. Finger and toenail changes: These can indicate another problem. Watch for thickening nails, white spots, or red lines. Skin cancer: Commonly caused by sun damage, skin cancer can be due to tanning or simple exposure. Typically revealed by new or changing spots on the skin, it may also appear in places not usually exposed to sunlight. Warts: These are spots caused by viruses. Hand, foot, flat, and genital warts are the 4 most common types. Warts are usually the same color as surrounding skin but may feel rough. At Brunswick Internal Medicine Group, we care deeply about the health of every patient. If you have any questions about the insurance we accept or how we can partner with you, please call our office. "Dr. Kainth was extremely down to earth and personable. His staff was very friendly and professional... I am very happy and will continue to see him. Highly recommended!" "He was referred to us by our friends. He is wonderful. Very empathetic and knowledgable... Highly recommend anybody to choose him as their primary doctor." "Dr. Kainth is a fabulous physician... He's always available in case of an emergency and if we need an emergency appointment for the day we call - we receive it." "Very nice and courteous doctor. Treats you with respect and spends time answering all questions. I would gladly recommend him to all my friends. Very nice staff also..."